Taizy machine's TZY-C Chaff Cutter machine is made of thick steel plate and 65 manganese steel knife, which replaces the metal/steel knife used by other manufacturers, which is more durable and sharper than it! The machine is equipped with long, empty and short three-speed, adjustable weed length. This Chaff Cutter machine can not only cut the forage, but also crush the grain. The Chaff Cutter machine is used for chopping all kinds of forages such as green, hay, cereal, straw, wild grass, wheat straw, corn stover, etc. It is a widely used economical weeding equipment, which is small in size and light in weight. Installation, operation, easy maintenance, high production efficiency and so on. 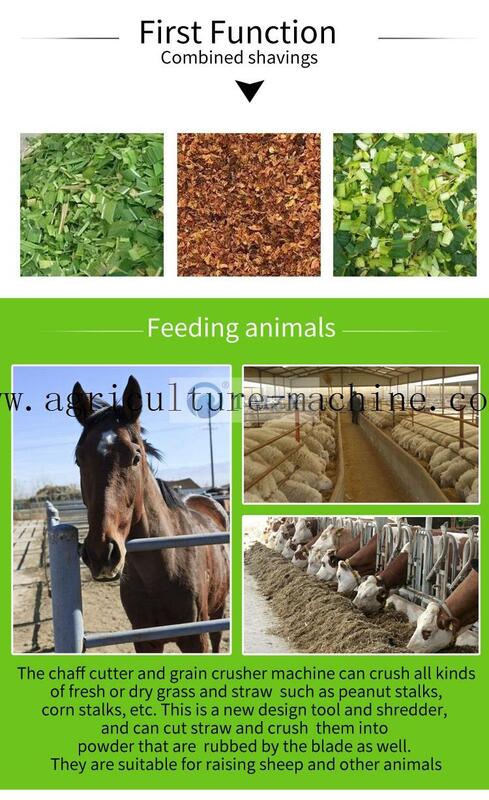 Production for feeding cattle, horses, sheep, pigs and other livestock forage and manure, straw returning. Main use: Feed the grass into a small section of 1 to 2 cm to feed cattle, sheep, geese, fish or make green storage. Can process a variety of forage and straw, wet and dry. The Chaff Cutter machine is mainly composed of a body, a grass roller, a knife holder assembly, a blade, a feeding device, and a frame. This weeding and smashing machine mainly has a frame part, a roller part, a grass feeding part and an overload protection device, and has a simple structure. First, the mechanism is compact, small in size, light in weight and convenient to move. Second, the two rollers can automatically "eat", reduce the labor intensity when discharging, and improve efficiency. Three or four blades are made of 65 manganese steel knives. The blade is sharp, and the grass that is pulled out is not only flush, but the breaking rate is high, and the quality of sorghum is good. Fourth, the machine is equipped with an overload protection device, which can avoid the malfunction of the card machine that occurs when there is too much discharging. Cut green, dry corn stalks, wheat straw, straw, alfalfa and various crop straws and pastures.